Possibly one of the funniest picture books you will ever pick up. Ben gets a present. When he unwraps it, he finds a penguin inside. Understandably he tries to engage the penguin in conversation and to get some kind of reaction from him. But Penguin says nothing. And ‘Penguin said nothing’ is the most repeated line of the rest of the book, to the great delight of young readers, who will be in stitches at Ben’s desperate attempts to elicit even a smile from the inscrutable bird. He tries everything, but Penguin just ignores him. Visually stunning and sparely and comically written, this is the picture book at its best. The moment you open this book you know you are reading something special. The opening line – “Once there was a boy, and one day he found a penguin at his door” – has just the right amount of surreal humour. And let’s face it: everyone loves a book about penguins! The boy, frustrated at being followed continually by the penguin, decides to help it return home. After thwarted attempts to palm it off on the Lost and Found office and to help it on board a boat bound for the South Pole, the boy loads his own rowing boat and sets off across the ocean. There is no attempt to suggest that this is anything other than a reasonable thing to do – and it is that that makes this book something out of the ordinary. Children love to be absorbed by their fantasies, and the acceptance that rowing a penguin to the South Pole wearing little more than a woolly jumper and a bobble hat is perfectly normal is both hilarious and charming. 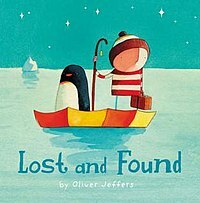 Oliver Jeffers is now well-known amongst readers of children’s books for his stylish illustrations and his quirky, original ideas. The faces of his drawings are not terribly expressive, which far from detracting from the story adds comedy at moments like the boy’s vain attempt to ask the duck in his bath for advice. His writing in this book is also very good, however. There are simple metaphors and a minimal amount of text; even a relatively young toddler would have enough patience to sit through each page. The slightly arch humour (“he asked some birds if they knew where the penguin came from, but they ignored him. Some birds are like that.”) will amuse older children as well. Clearly I am not the only one to have seen the potential in the story. It has been extended and made into a 25 minute animated film which is itself beautifully crafted. Although the story has been necessarily embroidered, the tone of the book is maintained and if anything the details in the film enhance the sense of a relationship between the boy and the penguin. In the end, the boy realises that “the penguin wasn’t lost. He was just lonely,” and what was a fantastic adventure becomes a tale about finding friendship in unlikely places. The book ends with the two characters, now friends, sharing stories all the way home, and the final birds-eye-view illustration of the tiny boat floating above the shadows of two enormous whales is surprisingly moving. Lost and Found reads simply and elegantly, and the illustrations are memorable and engaging. Popularised by the film, it looks set to become a modern classic.